Martin Samuelsen in action at Scunthorpe. Peterborough United manager Grant McCann insists the arrival of midfielder Martin Samuelsen for a second loan spell at the ABAX Stadium doesn’t mean the club are about to sell a prize asset. Samuelsen made his second Posh debut - he was on loan at the ABAX Stadium from West Ham last season - in Monday’s (January 2) 1-1 League One draw at Scunthorpe. Posh skipper Chris Forrester (right) is a transfer target of Championship clubs. Posh have also signed central defender Dominic Ball on loan from Rotherham United until the end of the season. He can also play in midfield, while his arrival could also release Michael Bostwick back into a central area. Posh now have an apparent surplus of midfielders. Summer signing Brad Inman didn’t even make the matchday squad at Glanford Park when a late own goal secured a fine 1-1 draw. 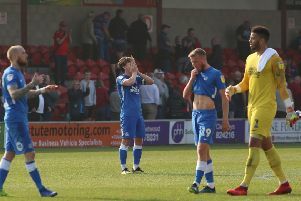 But McCann doesn’t believe Posh will now take the oppportunity to flog either captain Chris Forrester or teenage talent Leo Da Silva Lopes, both of whom have been linked with January transfer window moves away from the ABAX. “I hope not,” McCann replied when asked the question by the Peterborough Telegraph. “We do have plenty of good midfield players now, but we haven’t made signings in preparation for others to be sold. Posh teenager Leo Da Silva Lopes (right) has been linked with a january move away from the ABAX Stadium. “Obviously club policy is not to stand in a player’s way if a deal is right for the club, but I have heard nothing to suggest that is about to happen. “The opportunity to bring Martin back was too good to turn down. He’s a very gifted player who will add creativity to the side. “Dominic is a good footballing central defender. He’s an extra option for us defensively as he can play centre-back, full-back or the holding midfield role. He helped Rangers win the Scottish Championship last season and we are delighted to get him. Samuelsen and Ball are both eligible to play in Sunday’s (January 8) third round FA Cup tie at Chelsea.